I am sure all of you are by now aware that Shaikh Raheal Ahmad, a prominent member of German Jamaat, had quit Jamaat Ahmadiyya on 23rd August 2003. Following is his message for all of you. Shaikh Raheal Ahmad had been a 3rd generation Ahmadi, had held many important posts, starting from Saaiq of his street at the age of 8 years, ending up as Member of the central body of Humanity First and its spokesman, a post which he held for three years, until he decided to resign from all posts ywo years back. After careful consideration, study of original Ahmadiyya literature (books of Mirza Ghulam Ahmad Qadiani Sahib, his sons, and his close associates, he decided to call it a day. He denounced Mirza Ghulam Ahmad Qadiani and his Jamaat and embraced Islam on 23rd August 2003 in Tauheed Mosque in Frankfurt, Germany. Following is part of his message to you. For full text of his message please click here. Now I want to put a question to my Qadianis friends who are present here and through them to other friends, that ok for the sake of argument, let us accept that Mirza Ghulam Ahmad Sahib was a prophet. Do Allah grant the supplications of prophets in favour of their ummat or not? and in those supplications of prophets, are there or not included supplications to raise in his ummat pious, God fearing, and people capable of leading? Now either Mirza Sahib's supplications were not granted or he did not supplicate for raising good people in his ummat. Either way it castes a shadow of doubt on the prophethood of Mirza Sahib, because according to the claims of Jamaat, its strength is 200,000,000 (although the numbers are doubtful, but let us accept it for the time being). Among these 20 crore was there not a single person who could come up to the standard of Taqwa (God fearing), piety, honesty and leadership, whom you could have chosen for a Khalifa? 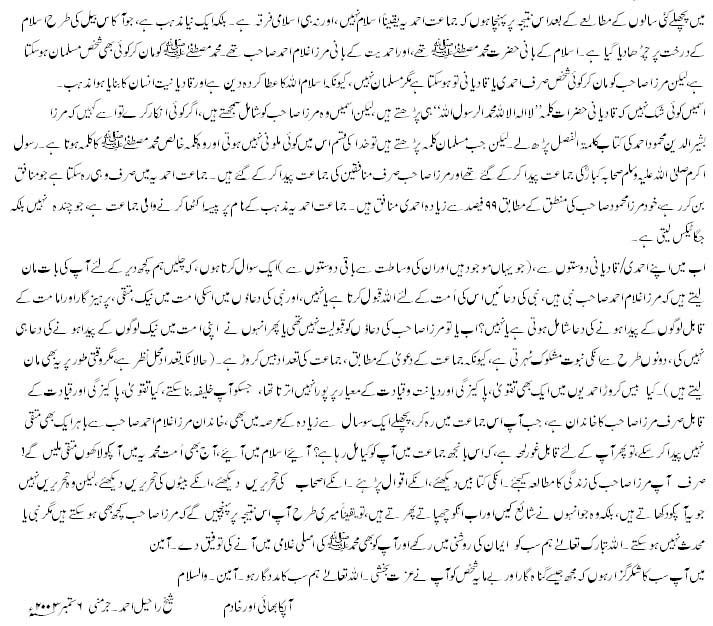 Is only the family of Mirza Sahib capable of Taqwa, piety and leadership? When staying in this Jamaat, for the last more than hundred years you could not give birth to a single God fearing person outside the family of Mirza Ghulam Ahmad Sahib, then it is time for you to think that what are you getting in this impotent Jamaat? Come! Come into the fold of Islam, even today you will find hundreds of thousands of God fearing people. Just study the life of Mirza Sahib, look at his books, read his sayings, look at the writings of his companions, look at the writings of his sons. Not those writings which they show, but those writings which they had published but now they hide them from you. Then, like me, you will also reach the same conclusion that Mirza Sahib can be anything but a prophet or muhaddith. May Allah keep all of us in the light of Imaan and give you also the guidance to come into the orginal servitude of Muhammad SallAllaho alaihe wa Sallam. Ameen. I am grateful to all of you that you gave an honour to such a sinful and worthless person like me. May Allah help us all. Ameen.